If you look deeply into the palm of your hand, you will see your parents and all generations of your ancestors. All of them are alive in this moment. Each is present in your body. You are the continuation of each of these people. In turn, your children will be a continuation of you. A cloud cannot die. It can become water or snow; it cannot become nothing. It is also impossible for us to die. Many of us ponder: What happens when we die? In order to answer the question, we should reflect on what happens when we are alive. In every moment, we produce thoughts, words, and actions that affect others and continue into the future. When we say a compassionate word, that is our continuation. When a cloud is polluted, the rain is polluted. Are our thoughts, words, and actions ensuring a positive, beautiful legacy for the world? Are we choosing anger and hatred or understanding and forgiveness as our continuation? Many of us have been profoundly touched or transformed by Thay’s books or a talk he gave. 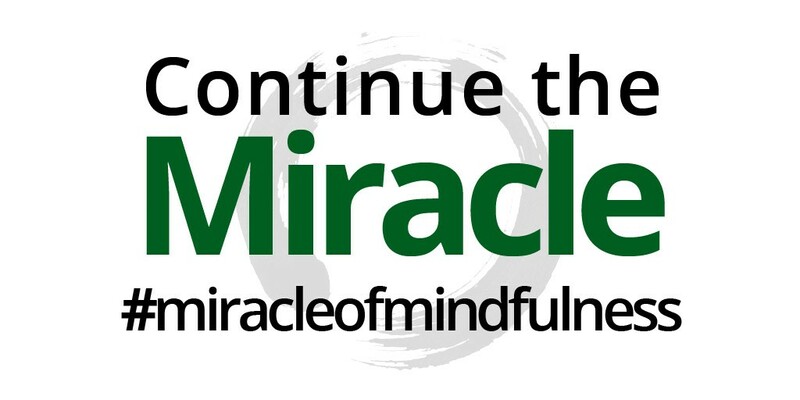 We invite you to share how you are a continuation of Thay, how you are part of the miracle, by using the hashtag #miracleofmindfulness. In addition, look for the daily reflection question this week on Thay’s Facebook page to help celebrate his legacy. Thanks for sharing this brilliant knowledge. I totally agree, that what we have to do is to develop compassion to unlimited and boundless level, as that is the only way for us to fulfill the aim. Thank you.